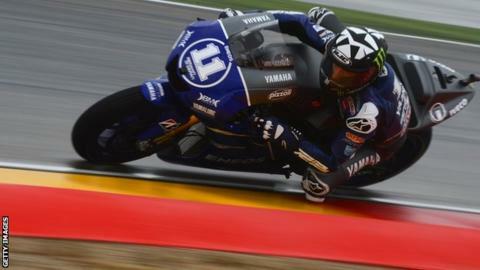 Yamaha rider Ben Spies clocked the fastest time during wet practice for Sunday's Aragon MotoGP in Spain. Spies - team-mate of championship leader Jorge Lorenzo - set the best time of two minutes 0.219 seconds in the afternoon session. Dani Pedrosa was 0.066 seconds back in second, with Lorenzo in third spot and Briton Cal Crutchlow seventh. Only nine riders clocked a time during the morning session which was delayed by more than an hour. Crutchlow said: "We have to take another step tomorrow if the conditions are the same but I am confident I can be very competitive in the wet. "The set-up of the bike is good and with some improvements if we have more rain tomorrow, I'll be looking to be back on the front row again. "I hope the rest of the weekend though is dry and the fans can see a good race." First practice was held up when oil was spilled across the circuit following a heavy crash in the Moto3 session. When the riders did venture out onto the damp track, Ducati rider Nicky Hayden finished the morning session fastest, but some 15 seconds off Casey Stoner's lap record as most of the field stayed in the garage.